It is with sadness that we report the death of Pat Southerby . Pat has been an active member of the club for many years, enjoying workshops and club meetings, also joining us on club trips. At recent club meetings we've just loved her daring pink hair!!! Dear Pat she will be missed by us. We have been donated a portable easel in ‘as new’ condition. 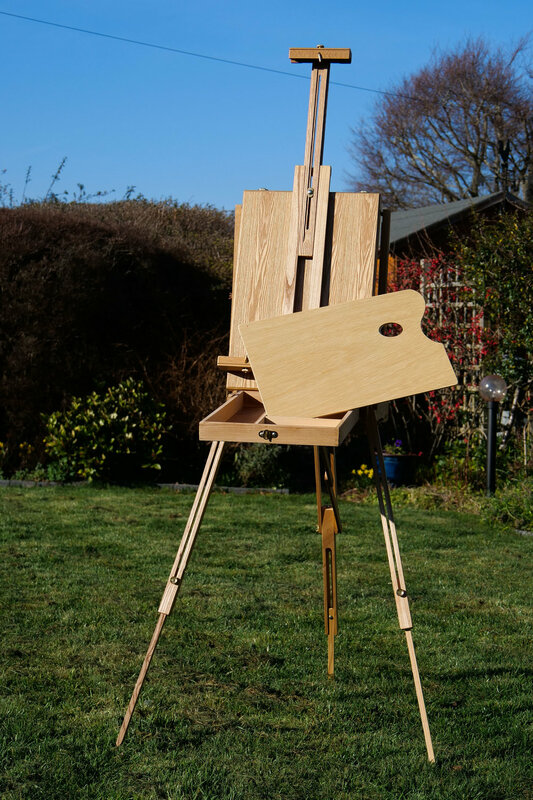 The easel comes complete with storage tray and palette and could be used in the studio. Proceeds from the sale will be given to our chosen charity- BRACE. Please contact mail@clevedonartclub.co.uk for further information. A new exhibition at the Museum of Somerset. Doris was a Somerset pioneer of British modernism. She exhibited her vibrant works over almost five decades, beginning in 1920, and contributed to many exhibitions in the South West. Doris lived in Clevedon from 1922 firstly at Corsica Villa, Marine Parade and later in the distinctive Art Deco/Bauhaus building, Littlemead. Doris’s painting style developed over time as she absorbed the major influences of 20th-century modernism, including cubism, purism, abstraction and the works of Cézanne, Picasso, Braque, Dufy and Léger. Her work includes portraiture, still life and landscapes. The charge for this exhibition is Pay What You Think. A new book, “Doris Hatt Revolutionary Artist” has been published by South West Heritage Trust to accompany the Exhibition. The local Art world is mourning the passing of Neil Murison RWA, one of our best loved and influential artists. Despite not living in the area, Neil has been the President of Clevedon Art Club for over 30 years. He loved his association with the club and his charming presence at so many club events will be so sorely missed by it's members. Born in 1930, Neil was a student at the West of England College of Art, before teaching at Queen Elizabeth's Hospital and the Blue Coat School in Bristol. He later became a lecturer at the West of England College of Art retiring in 1987 as Head of Foundation Studies at Bower Ashton which was then part of Bristol Polytechnic. He was a full Member of the Royal West of England Academy of Art from 1979 and was Director of The New Gallery at The Academy from 2003-09. He was made an Honorary Member in 2000. Neil described himself as a "visual sensualist" he said: 'My work is strongly based in nature. I keep sketchbooks and take endless photographs on my travels and am never short of source material’. Neil loved travelling his first visit to the Caribbean was to Grenada in 1984 and he became totally enchanted by the sea, sand and palms. This interest in the tropical landscape was subsequently developed in Tobago, Kenya, Goa, Thailand and Sri Lanka. He worked in acrylic, using it sometimes like watercolour and sometimes opaquely like oil, but always rich in colour. His paintings have natural life and style and he is totally compulsive about his work. It reflects all the countries he has visited and he constantly returns to this love affair he has with the tropics. His work also includes sumptuous flower paintings, colourful landscapes and figurative interpretation. Neil said that each trip abroad prompted its own response and produced paintings which would reflect the memory of that experience. Neil exhibited extensively in galleries throughout the United Kingdom, France and Germany, and his work is represented in private collections in Georgia and Florida in the United States. He has had over forty solo shows since 1963 and his paintings are in the collections of the Bank of America in London and Amsterdam, Merchant Bank of Scotland, Government of Portugal, Oxford University, the Contemporary Art Society of Wales, Bath University and other notable corporate institutions.